Email marketing is one of the most effective and consistently successful marketing channels in terms of ROI for retail brands. According to the DMA’s Marketer Email Tracker 2018 report, 86% of marketers say it is ‘important’ or ‘very important’ to their multichannel marketing strategy. Meantime a study by Econsultancy shows email marketing generates around £29bn of retail sales annually in the UK, excluding offline sales influenced by email. But to stand out in the increasing cluttered email space you need to be more creative & communicate one to one with each customer using highly tailored communications. "We work hard to perfect the tricky blend between personalising our inspiring email content so that it’s relevant to the user, without making our members feel targeted." Retail brands use email to increase sales at all points on the customer journey, to keep up with competition and engage audiences further in the customer lifecycle. Marketing activities supported by emails such as personalization, loyalty programs and re-engagement programs are vital to retailers email marketing strategies. According to Experian, emails with highly personalized subject lines are 26% more likely to be opened and leading retail brands are utilising this trend and getting big benefits. 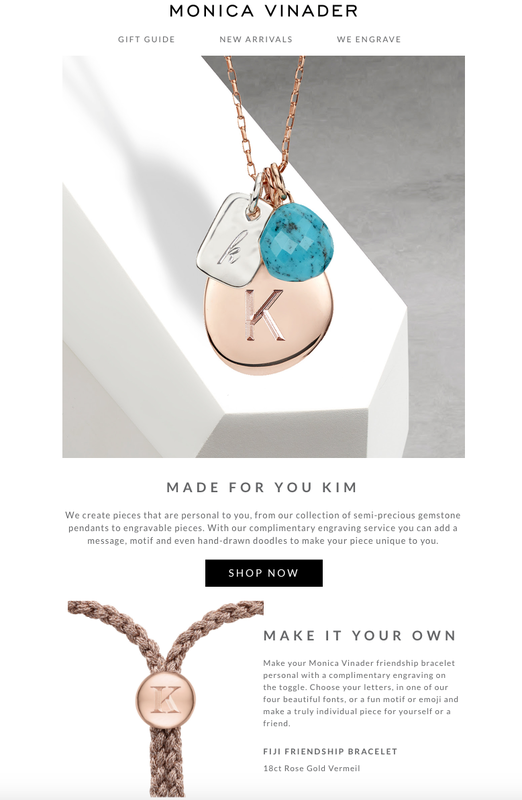 For example, British jewellery brand Monica Vinader upgraded their email marketing efforts by personalising subject lines, for example “This season it’s personal” and not only including a customers' first name in email communications but further improving relevance by personalizing images in the body to create highly tailored 1-to-1 emails. Relevancy is the marketer’s secret to success, and the fastest path to generate revenue. According to an Experian report, marketers have achieved up to a 760% increase in email revenue from segmented campaigns. Leading retail brand Adidas segments its customers' data based on gender. Rather than sending a generic email to all customers with all their shoes, now they send an email highlighting hip, new men’s shoes to their male customers, and cute women’s shoes to their female customers. Retaining a customer is one of the key priorities for any business as It’s a well-established fact that it costs five times as much to acquire a new customer than to retain an existing one. And email marketers take pride in being associated with one of the most successful marketing channels with 81% customer retention. But this is only possible if you have engaging emails i.e. 1-to-1 highly tailored email content according to each customers’ need & behaviour at the right time throughout the customers journey. Think about your own preferences and actions online. Wouldn’t you be more likely to engage to a communication that resonates with you and speaks to a need or desire you have versus a generic offer that may totally miss that mark? Knexus is an AI decision making engine that automatically matches your customers with highly relevant marketing or social content and delivers to any digital touch point including email, websites, ecommerce, mobile app or stores, chatbots. This create highly relevant customer experience which improve conversion, loyalty & sales.